I'm proud to present Adverbially Challenged Volume 4, the fourth book in the Adverbially Challenged series. We have surpassed trilogy status and moved into the realms of tetralogy. Will we have to use the word 'pentalogy' in the future? Oh yes, I think we assuredly will. The book was officially launched on Saturday 16th March 2019. It contains 100 adverb-stuffed flash-fiction stories, written by 100 authors who submitted their adverbially-saturated prose to Mike’s Not-Entirely-Serious Wantonly-Rule-Breaking Adverb Writing Challenge. Adverbially Challenged Volume 4 gained a special mention for 'Best Anthology' in the 2019 Saboteur Awards. Adverbially Challenged Volume 4 is available from Amazon in print and Kindle eBook formats. Proceeds from book sales will be donated to First Story, a charity that helps improve literacy in low-income communities. You can learn more about FS in the 'about the anthology' section below. Adverbially Challenged Volume 4 contains 100 adverbially-overloaded stories submitted to Mike’s Not-Entirely-Serious Wantonly-Rule-Breaking Adverb Writing Challenge. The challenge was conceived by Mike Scott Thomson, a tall man (to be fair, many people seem tall to me due to my stumpy stature, so 'tall' might be an unfair accusation - you can decide for yourself when/if you meet him) who lives in London. You will find a full history of the adverb writing challenge in the introduction of the book. It has become surprisingly epic. 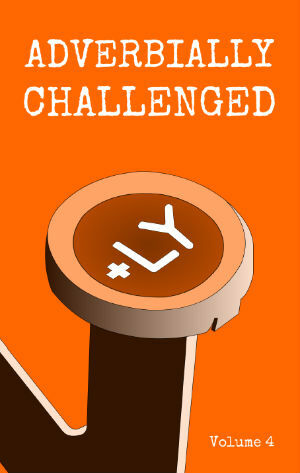 When we launched the challenge, we assumed people would think it was a silly idea. Well, they did, but it seems people like being silly. Hence, the adverb challenge has become an epic beast worthy of a place in literary history. 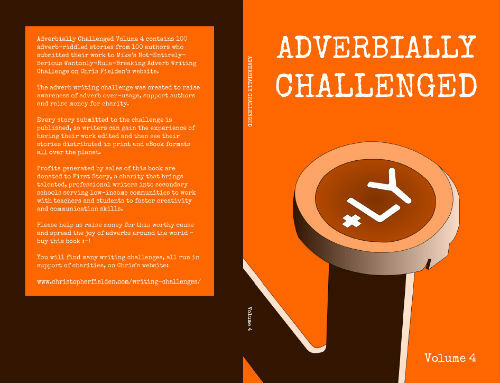 At the time of its publication, Adverbially Challenged Volume 4 was the eighth writing challenge anthology released. When it was launched, the book got to number 9 on Amazon in the category 'Fiction Anthologies', alongside some pretty epic names. All the writers in Adverbially Challenged Volume 4 submitted their stories to Mike's Adverb Challenge, which is one of the many writing challenges run on my website. Abigail Rowe, Alan Barker, Alex L Williams, Alicia Sledge, Allen Ashley, Alyson Faye, Andre Othenin-Girard, Andrew Jones, Angela P Googh, Anita Goveas, Annalee Macfarlane, Anne Babbs, Arlene Everingham, Ben Hopkins, Betty Hattersley, Beverley J Hall, Bridget Scrannage, Carmen Bock, Cathy Cade, Christopher Fielden, Claire Apps, Clare Tivey, David McTigue, David Silver, David Wright, Debaprasad Mukherjee, Debbie Singh, Dedra Tullison, Elizabeth Coby, Emma Leeming, Franca Basta, Francesca Pappadogiannis, Gavin Biddlecombe, Gillian M Seed, Gillian Wright, Hannah Brown, Hullabaloo22, Irene Lofthouse, Isabel Flynn, J.A. Palmer, Jack Evans, Jade Robinson, James Michael Lindsay, Jamie Einchcomb, Jan Brown, Jan Lister, Jay Bee, Jessica Turnbull, Joanna Shaw, Johanna McDonald, John Notley, Joseph Martin, Joseph Spence, Josh Leeson, Kathryn Evans, Kelly Van Nelson, Khamis Kabeu, Lanie Goodell, Laura Tipping, Lesley Anne Truchet, Linda Hutchinson, Lindy Gibbon, Liz Berg, Lucy Morrice, Maddy Hamley, Malcolm Kerr, Malcolm Richardson, Margaret Stokes, Maria Carvalho, Marlene Pitcher, Martin Strike, Matilda Rice, Meg Gain, Michael Rumsey, Michelle Payne, Mike Scott Thomson, Nam Raj Khatri, Nathan Land, Neil Phillips, Pat Hough, Peter Corbally, Rachel Pickett, Rene Astle, Robbie Porter, S. M. Chiles, Sandra Orellana, Sandra Purdy, Sarah Ann Hall, Sarah Brentyn, Sarah Howard, Sarah Mosedale, Stéphanie Constans, Steven Barrett, Sue Partridge, Tiarnán Murphy, Tony Thatcher, Valerie Fish, Victor India, Victoria Ryan and Wendy Roe. 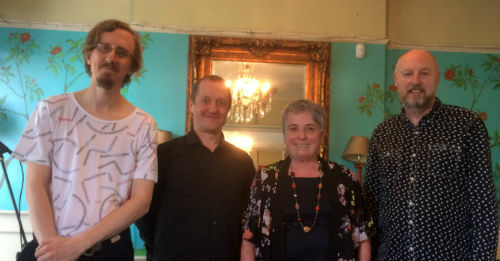 The book launch party will take place on Tuesday 13th August 2019 in conjunction with Talking Tales at LeftBank, 128 Cheltenham Rd, Bristol, BS6 5RW, UK. We will also be celebrating the launch of Sensorially Challenged Volume 2 at the event. The book's cover was designed by David Fielden. Unfortunately for Dave, he's related to me. Life can be very unkind. 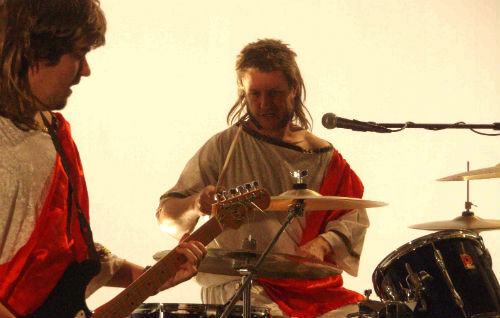 Dave and Chris, dressed in togas, playing rock, because... well... why not? When not losing the will to live due to his brother's constant book cover and website related demands, Dave dances around ancient monuments naked and tries not to get arrested. He sometimes licks people in super market queues and then pretends he didn't do it, even when CCTV footage proves otherwise. His favourite car is the Suzuki Wagon R (yawn) and he's addicted to pink toenail polish. Yes, Chris wrote this biography for him. If he can't be arsed to write his own, the truth will be told. The whole truth. Nowt but the truth. Only the truth. Nothing in this biography has been made up. NOTHING. Hi Chris, this is good news. I'm looking forward to getting my grubby little paws on a few copies, and press-ganging unsuspecting family members/passers-by into buying into this worthy cause. 100 authors? We certainly knock the Bronte sisters into a cocked hat. Press-ganging is highly recommended and a fabulous way to elicit sales. Good idea - top work, sir. I'm delighted to secure this latest volume to add to the spectrum of 'Challenged's' in my personal library. Can I suggest bruised peach as the colour of the next tome? Well done Mr Chris. Never mind cocked hats, this is yet another feather in your great clucking chicken of literature. We all love you! Thanking you, Mr Martin. We've just hit the top 10 best sellers in the 'Fiction Anthologies' category alongside some proper famous people, which is most pleasing. Are you coming to read at the book launch in August? Top-ten-tastic, here's pushing for single digits. Make way proper famous people. Our presence at the launch may occur. Will know for sure nearer the time. Most excellent, good sir. Hopefully see you in August, if not before. My Noble Liege, due to reduced circumstances I have not been able to order as many copies (2) as I'd hoped in the first instance. I have donned the hair shirt of ignominy, for keeping us off the Sunday Times Bestseller List. However, people have birthdays in the months ahead and will have this volume in their goody bag. Those who are especially good will get the new sensorially opus too. Most excellent, good sir. You are a legend and a gentleman, indubitably. I hope those lucky folk enjoy their goody bags, made all the more glorious by being overloaded with adverbs and sensory description. Thanking you re the tour. I'm looking forward to it. Hope to see you in August for the launches.